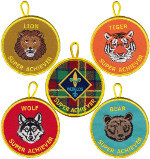 All ranks - Lion Tiger Wolf Bear and Webelos - have core and elective adventures, so there is a Super Achiever Award patch for each rank. Recognizing all scouts that complete more than the required adventures for their rank with these 3-inch diameter, button-loop patches can help keep scouts active each year after they've completed their basic rank requirements. Choose the quantity of each patch and click the "Buy Now" button. $2.00 per patch, plus $1.50 shipping per order of any size. Orders of 18+ patches include USPS Package Tracking. You may add Package Tracking to small orders for $2.